Police have brutalized protestors of the Dakota Access Pipeline (DAPL) in North Dakota over the past year. But this photo of burning tipis, which is now going viral, isn’t from the protests. It’s from a fictional HBO movie that aired ten years ago. Protestors have been clashing with police over the DAPL since April. And despite a brief respite in September, when Obama ordered construction on the pipeline to stop, things are heating up again as President Trump vows to push the pipeline ahead as originally planned. Twitter user Lina Lightbringer tweeted out the photo yesterday with the caption, “America, 2017. Police, burning down the NoDAPL home base, tipis and all. Utterly, thoroughly, grotesque & monstrous.” As bad as it looks, however, it’s totally fake. A version of the photo was actually used as a publicity shot for the 2007 HBO TV movie Bury My Heart at Wounded Knee. You can see the original at HBO’s website. Not only has the altered photo been cropped to take out the man on the horse, whoever made it also added snow and hay bales. The fake image has popped up on at least two news sites, including something called If You Only News and Alternative Media Syndicate. It’s unclear if Lightbringer posted the photo first or if the Twitter user merely got it from one of these sites. So, what have the campsites of the protests really looked like over the past year? Militarized police shooting protestors with water cannons in sub-freezing temperatures and spraying protestors with pepper spray. Make no mistake that protestors and the journalists covering the protest have been brutalized by police. The response has been horrifying for people who believe that Native Americans should have a say in the way that their land and resources are being used. 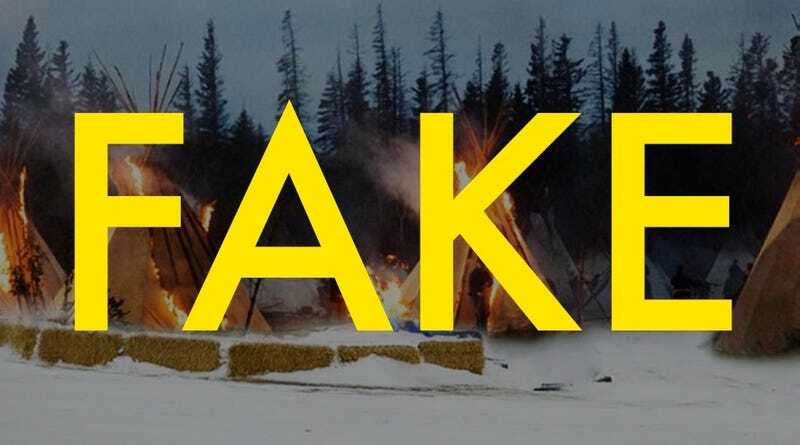 But that photo is totally fake, and it does a disservice to the cause of the water protectors when people spread fake information, knowingly or not.